Illus. in black-and-white. 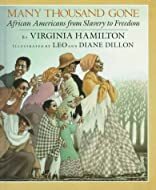 In this companion volume to the award-winning The People Could Fly, Virginia Hamilton traces the history of slavery and the Underground Railroad in America. Thirty-five inspiring stories describe ingenious escapes, desperate measures, and daring protests of former slaves. "Hamilton is neither sensational nor sentimental, even as she celebrates the many acts of shining courage. This makes us all want to know more, much more, about those many thousand gone." --(starred) Booklist. "A compelling book, outstanding in every way." --(pointer) Kirkus.